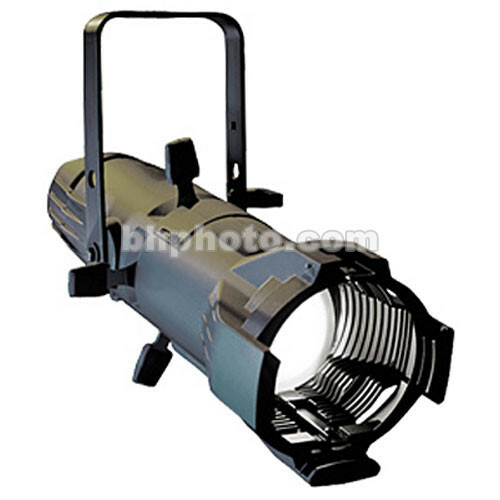 The 26° Source Four Junior 575 Watt Black Ellipsoidal Spotlight with Stage Pin connector combines the energy-saving power of the patented HPL lamp, with a dichroic reflector and optical-quality lenses. Source Four technology provides a clean white beam for unequaled imaging, crisp pattern projection, and a bright, even field. The Source Four Jr is perfect for - but never limited to - smaller theatre venues, churches, schools, industrials, and any other application where affordability, space-savings and high performance are the criteria. When fitted with a 575 watt HPL bulb (available separately), this fixture will provide a beam of 102 footcandles 13.8 ft (4.2 m) in diameter, from a distance of 30 ft (9 m). It will throw 45 footcandles 20.7 ft (9.4 m) in diameter, from a distance of 45 ft (13.6 m). This model includes a Stage Pin connector. Other models are available, with Edison Plug, Pigtail, and Twist-Lock connectors. The Source Four Junior is also available with a 36, or a 50° lens tube. The special HPL bulb and borosilicate reflector provide more lumens per watt: at 575 watts the Source Four literally outshines other brands' 1000W ellipsoidals. Accepts Size "M" steel gobos for projection of a vast multitude of patterns or company logos. The patented, optional Dimmer Doubler allows two lighting fixtures to operate independently using only one dimmer (in North America only). Box Dimensions (LxWxH) 24.0 x 10.0 x 10.0"